Videos may inform, they may educate, but words on a page or screen can do the same thing for less money. The reason smart marketers choose video is because video is much more likely to stir emotions and connect with an audience. Looking for an example? Look at how college football programs market to their fans. 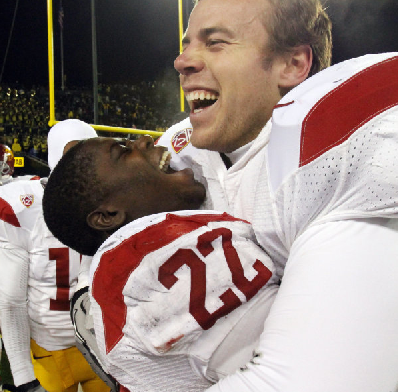 One of the biggest upsets of the weekend involved USC knocking off #4 Oregon. The Trojans create a video to show the team before every game, and they also share it on YouTube for all their alumni and fans. Normally, it’s simply highlights set to rap or rock music, but this week USC kicked it up a notch. They took an inspirational speech by defensive line coach Ed Orgeron and spun it into a video that stirred emotions. The Trojans aren’t often the underdogs, but the school’s video team played up the role to perfection. Good written content paired with music and beautiful images… storytelling at its best. Businesses need to pay attention. Video is a way for companies to connect with clients and prospects. Could words alone have done this? Maybe. But I challenge anyone to tell me they’d be more effective than this video.